Australian Captain & Deputy Captain Steve Smith and David Warner who were hemmed in with the latest ball-tampering scandal will now face the ban of a year from international matches. Following the announcement from Cricket Australia who handed over stern punishment of one year ban for both of them, The Board of Control for Cricket in India (BCCI) added hardship for both of them by debarring from IPL. Prior to this decision both the skipper and deputy stepped down from the leadership of Rajasthan Royals and SunRisers Hyderabad. ICC, on the other hand, awarded alleged cricketers with by banning Smith for one match and handed Bancroft a heavy fine as per their rule which put ball tampering as Level 2 offense. 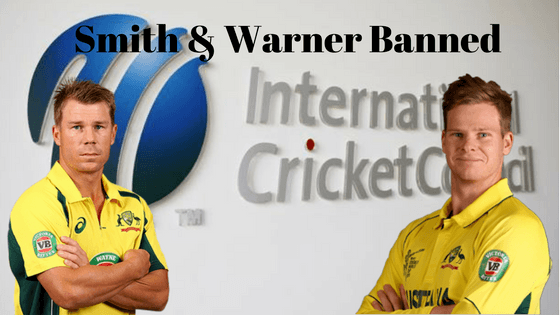 Warner name involved in an independent investigation conducted by Cricket Australia (CA) precedent to Smith denial to take names of leadership group involvement. BCCI elicited the spirit of the game by debarring both Australian cricketers from the 11th season of IPL. As per the release of BCCI today on Wednesday which being articulated as “The Hon’ble Supreme Court of India appointed Committee of Administrators (CoA) on Wednesday took cognizance of the developments in the ball tampering incident involving Cricket Australia contracted cricketers – Mr. Steve Smith, Mr. David Warner, and Mr. Cameron Bancroft,”. “The BCCI hopes that the cricketers participating in the IPL hold the highest regard for the Spirit of Cricket and Code of Conduct for Players and Match Officials. The concerned IPL franchises will be allowed replacement players” further said by BCCI release on Wednesday. IPL chairperson Rajeev Shukla said that he waited for the decisions of ICC and CA before taking any action against the both Aussies players. For the IPL teams Rajasthan Royals and SunRiser Hyderabad, already they have appointed come up with the names who could replace Aussies as a Captain, while former appointed Ajinkya Rahane as their skipper. Both Smith and Warner paid with the highest amount of 12.5 crores among the Australian team now the whole repercussion of burden lies with the franchise. One of the most ironic parts that come out from this incident, last year when Mahi Cool was being forced to step down as a Captain of Pune by replacing Smith citing the reason as latter with good cricketing sense. This incident gives a crushing reply to decision makers of Pune franchise who prioritize their interest over Indian Cricket Spirit. Cameron Bancroft who was chosen by Australian skipper to pull out yellow tape ball tampering task now faces the ban of nine months while his leader Smith awarded with a year ban by CA, and will not be considered for captaincy for 12 months after the ban ends. Warner who is said to be the mastermind of ball tampering incident received a ban of one year and will never be considered for the post of leadership again in future.